Our gal Maggie Moo has found her forever home. We're so grateful for our supporters and to see this lovely gal finally settle into her forever home! How much happy can you handle? Let this pretty pittie in her party wings and ruffles leave her paw prints on your heart, and all you’ll ever be is happy. Why? Because marvelous Maggie Moo is ever happy, ever smiling, ever loving. Sunshine itself, one of her favorite spots to be is outside in the sunshine. 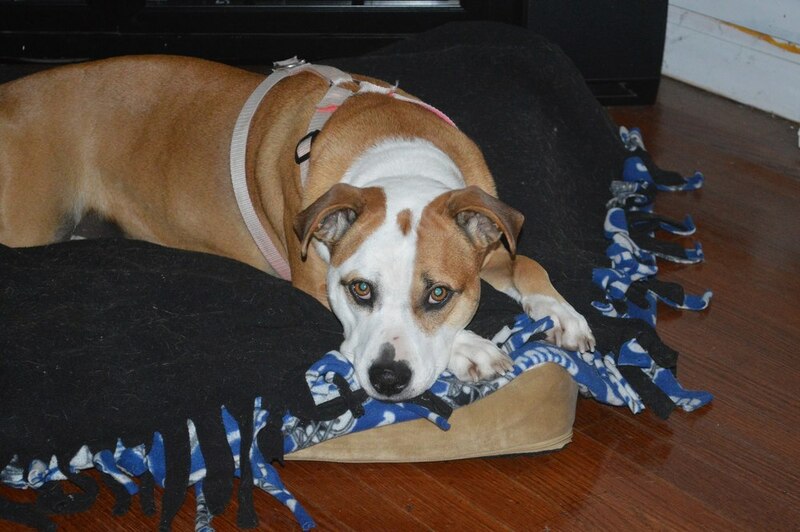 Active and energetic, she loves toys, games of fetch, going for walks, and romping with her three furry foster sibs. Offer her a ride in the car, and she’ll grin every mile of the way, either as a passenger in the front seat or as a sightseer with her shapely head out the window. Ask her for cuddles, and she’ll gladly comply, covering you with darling doggy kisses in exchange. Even tempered, easygoing, fully house and crate trained, this well-mannered miss was adopted out once, only recently to return. But with her wings ever ready, Maggie Moo is ready once again to soar – to a loving and active home with another social dog for company. This time forever.